Preheat oven to 375 degrees F. Line a baking sheet with foil and place a wire rack on top then spray with coconut oil spray. Place bacon strips on wire rack and place in the oven to cook for 15-18 minutes, until cooked to preference. Heat up a griddle pan or whatever pan you prefer and grease. Once hot, use an ice cream scoop or cookie scoop to make pancakes that are about 4-5 inches across. Let cook through until bubbles begin to appear on the top of the pancakes then flip, about 3-4 minutes per side. Continue until all the batter is gone- the batter should make 10-12 pancakes. Set pancakes aside and cover with foil to keep warm. In a large nonstick pan, add ghee or coconut oil to grease the pan that is over low heat. Then crack eggs into the pan and let cook for 6-8 minutes until all have cooked through whites with runny yolks. Sprinkle with salt and pepper and remove from pan. Whisk together avocado oil mayo and maple syrup to make a maple aioli. 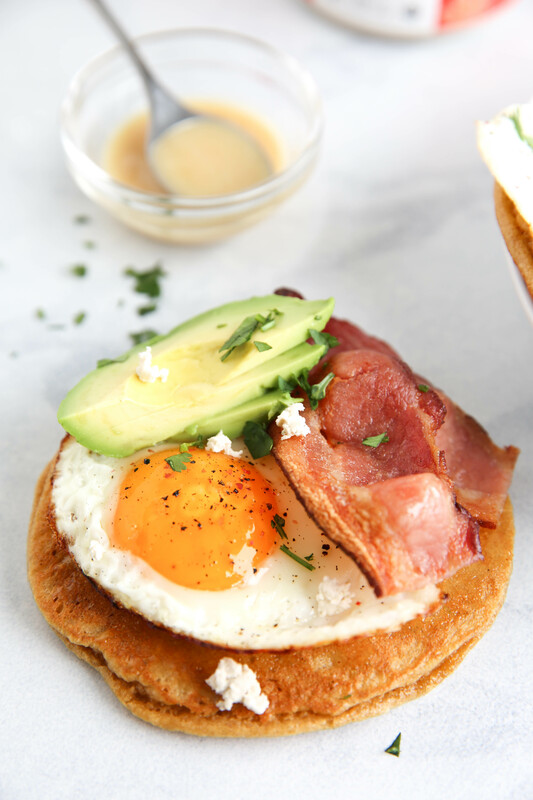 Then build your pancake tacos - spread on some of the maple aioli, then top with bacon, a sunny side up egg, a few slices of avocado, cilantro and dairy-free cheese! Then all you gotta do is eat, baby girl!